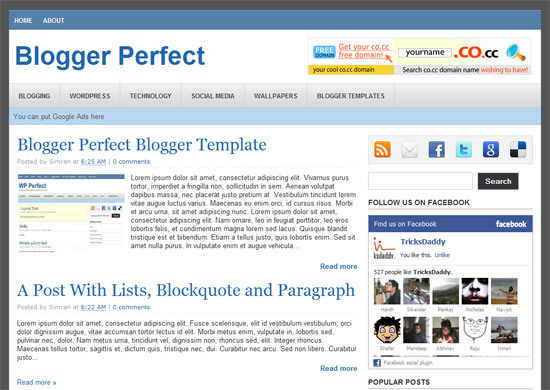 WP Perfect is my first WordPress theme that got accepted at official WordPress directory. The theme also got reviewed at many well-known blogs. Looking at the popularity of the theme I designed the blogger version of the theme that I’m going to release today. How to add new categories in nav menu? Sing in to your blogger dashboard and find <!– Categories Nav Menu –>. Below this code you will find some links to the categories. You can replace the links with your own categories..
Sign in to your blogger dashboard and find <!– Subscribe Options –>. Below this code you can insert links to your social media profiles. Downloading is not working . . .
plz check thee URL . . .
Download link is working. If its not working for you then you can try the mirror download link. Thanks Simran. All your blogger templates are perfect and easy to rip them apart so that we can customize them by ourselves! This template looks really nice. I like the professional yet clean and rather simple layout! Perfect template for the blogger. I have seen this themes on many wordpress blogs and looks awesome. Just as clean as always. Liked it, really. Why don’t u make a wordpress version of it. There are many who might try!! Really nice theme. Clean and professional looking. Great Achievement Simran. This is so much beautiful theme in which software you make this kind of beautiful themes. Looks nice. Good choice for those in blogger. Hey is there anyway on WP Perfect to have multiple categories? I love the nav bar but I need like 3 more separate category sections. Like if I posted something in the food section it would show under food as #1 and then I can also add it to Area #2 and then By Price #3 something like that? So people can have multiple search options.. Anyway this can be done? Thank you very and very much! i like two zipzap and wp perfect template! hi! I love the layout. It looks awesome. Can I ask how to put Adsense ads (specifically horizontal links) on the nav bar from the template? I put mine but I can’t put them on the nav bar. Please help me. Thanks! I am thinking of using this template as the Nav Bar is just brilliant but what is the background colour of the navigation bar on which you have suggested to put Google ads?